You can export the results currently appearing in a Coveo .NET Front-End search results page to a Microsoft Excel file format. This feature is useful when you want to save the results as a list and perform further operation on the data, or import the list of results in a database. Note: The Export to Excel feature is optional and is available only when your Coveo administrator enables it for the specific search interface (see Activating Search Interface Options With the .NET Interface Editor). Perform the query for which you want to export the search results. The results appear in the search results page. 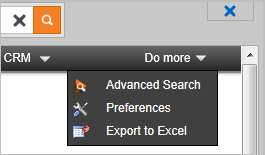 From a web .NET search interface or from the Desktop Searchbar, at the top-right end of the .NET search interface, in the Do more menu, select Export to Excel. Note: The creation of the Excel file may take several seconds when the number of search results is large. Your browser receives an Excel file. Each browser handles file download differently. Use your browser features to save the downloaded file to a location of your choice, or directly open it in Microsoft Excel. Note: The downloaded file name format is CoveoResults_mm_dd_yyyy.xls to include the month (mm), date (dd), and year (yyyy) the file was created. Coveo .NET Front-End 12.0.190– (May 2013) The file name is Excel.xls. You can safely ignore the message and open the file to see your exported search results. The Coveo exported file generates an HTML document with an Excel extension. Starting with version 2007, Excel validates that the file content matches the file extension and displays the above warning message when it is not the case. For more information, see the Microsoft document: Error opening file: "The file format differs from the format that the file name extension specifies". CES 7.0.8225+ (March 2016) The Coveo exported file generates an Office Open XML document, which is a supported file format in Excel 97-2013. Therefore, the warning message no longer appears.